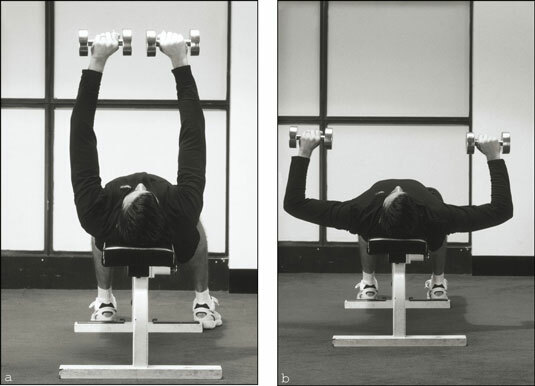 The dumbbell chest press closely mimics the bench press — the favorite exercise among serious weightlifters everywhere. This exercise works your chest muscles, shoulders, and triceps. If you have shoulder, elbow, or lower-back problems, limit the range of motion. You should lower and lift the dumbbells only a few inches to avoid overstraining these joints. Lie on the bench with a dumbbell in each hand and your feet flat on the floor. You can rest your feet up on the bench if it’s more comfortable. Pull your abdominals in, and tilt your chin toward your chest. Lower the dumbbells down and a little to the side until your elbows are slightly below your shoulders. Roll your shoulder blades back and down, like you’re pinching them together and accentuating your chest. Push the weights back up, taking care not to lock your elbows or allow your shoulder blades to rise off the bench. The dumbbell chest press works your chest muscles, shoulders, and triceps. Let your back keep a natural arch so that you have a slight gap between your lower back and the bench. Don’t contort your body in an effort to lift the weight. Lift only as much weight as you can handle while maintaining good form. When pressing the dumbbells up, have them form a triangular motion; they don’t need to touch each other. Sit so that the center of your chest lines up with the center of the horizontal set of handlebars. Press down on the foot bar (if your particular machine’s design has one) so that the handles move forward. Grip the horizontal handles and push them forward, straightening your arms. Lift your feet from the foot bar so that the weight of the stack transfers into your hands. Slowly bend your arms until your elbows are slightly behind your chest, and then push the handles forward until your arms are straight. After you complete the set, put your feet back on the foot bar and let go of the handles before you lower the weight stack all the way down. 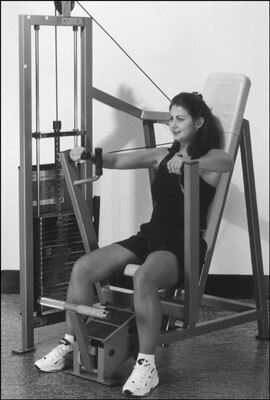 The vertical chest-press machine is an alternative to the dumbbell chest press.